I’ve been overweight for as long as I can remember. There was never a time in my childhood that I wasn’t considered the “chubby kid”. Of course I was still cute, but regardless, I was an overweight child and it continued throughout life. It affected all aspects of my life. It affected my social life because I never felt like I was truly “one of the girls”. It affected my school life because of embarrassment I never went to gym class and barely graduated high school because of it. It affected my romantic life because I didn’t feel confident within myself to attract a man that actually cared for me, nor did I think I was worth being loved. It affected my work because I was working with children and didn’t have the energy to keep up with them. They were playing at the park and I was sitting on the bench, as I had all of my life. After years of avoiding the scale like the plague, I finally decided to step on the scale in December of 2010, and saw that my weight was at an all time high. 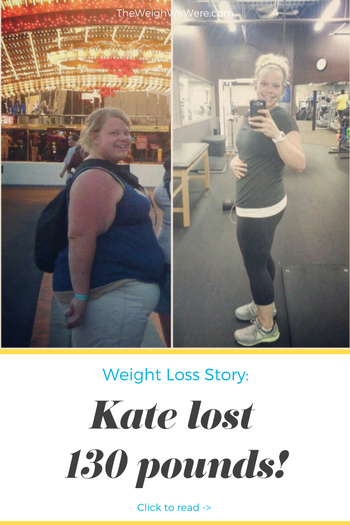 I was barely fitting into size 26 pants, and knew that something needed to be done. I took small steps and in 2 years lost approximately 40 lbs. In January of 2012, I hired a personal trainer and had my BMI tested, and when that number was so close to 50%, I knew it was time. I was 24, about to be 25, and I knew that if I didn’t do something now I never would. At first I was just limiting the amount of fast food I would eat. Instead of eating a whole pizza, I’d eat half. Instead of eating a double cheeseburger, I’d get a single. Or I’d order a salad, with a side of fries. For exercise I would go to the gym with my sister a few times a week, and I’d primarily do about 30 minutes of cardio, followed by various weight machines. Then when I hired my trainer, she would give me a workout to do once a week, and I would repeat that workout 3-4 times and on the other days would do strictly cardio. I started calorie counting, and invested in the Body Media Armband to help keep me accountable. 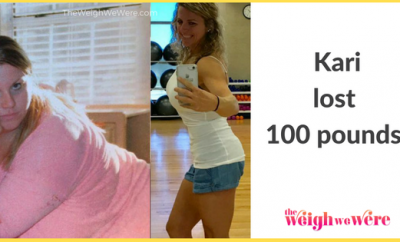 Within the first month or two I had lost 20 pounds, and although I could feel that my clothes were bigger, I was still having a hard time seeing any change in my body. It wasn’t til about 4 months in that I saw a picture of myself from before and then realized how different I looked just from 4 months prior. My face was smaller, my stomach was flatter, it was amazing to me and motivated me to keep going. There have been a few instances that it’s become “too much”. The worrying about what I’m eating, the feeling of not being “where I want to be yet”. Weight loss is obviously physical but more mental than anything else. What has kept me going, is that I haven’t given up yet despite those tough times. What keeps me going is knowing that I’ve already accomplished so much, and I know one day I will get to where I want to be. My motivation is my future. I’ve been in a plateau for a year. A YEAR. It’s immensely frustrating, but I have to take pride in the fact that I haven’t gained the weight back, and that I refuse to give up. I refuse to be the girl I once was, because if I ever do that means that old girl won. It took me a year to lose the majority of the weight, about 80 lbs. Oh goodness, SO MANY. I still have them today! Being able to cross my legs, being able to sit “Indian Style”, going from a size 26 jeans to a size 14! Facing fears to do things I would have never done when I was bigger, like going on a jet ski, or running a 5k. Those are the best kinds of victories. Compared to what it once was I’ve done a complete 360. When I was heavier, I would go all day without eating. Then, I’d have dinner, then a couple hours later would eat more, then another couple hours later I’d maybe go out with friends and get something to eat, then would end the night at either McDonald’s for 2 McChickens with cheese or make two peanut butter and banana sandwiches with a glass of milk when I got home. When I started my journey, I was the queen of Lean Cuisine’s and 100 calorie packs. I was more focused on the calorie count rather than what I was actually putting in my body. Now, I try to eat as “clean” as possible. The less processed the better. 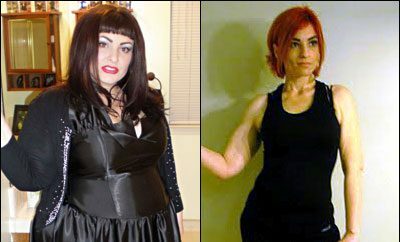 RELATED: 89 Pounds Lost: I can do all things! I wasn’t active at all when I was bigger. When I was out with friends, I was always tailing behind them because I couldn’t keep up. I was a nanny and couldn’t keep up with playing with the kids on the playground. Now, I run. I’ve completed two 5k’s, and hope to do more soon. I workout at least 5-6 times a week and I make it a priority because it just makes me feel good to be active. Small changes make BIG differences! Make small attainable goals for yourself. If you’re drinking 5 pop’s a day, cut it down to 3. When you feel like you can cut it down again, drop it down to 1! If you want to start being more active, dedicate 15 minutes a day to do something that you normally wouldn’t do. Walk down your block, walk around your house, something is better than nothing. Once that gets too easy, move the time up. Remember this is a lifestyle, and not a temporary solution. Once I hit my “goal weight”, that doesn’t mean I can stop working out and revert back to my old eating habits. If I did that, I could easily go right back to the way I was before. Learn to forgive yourself. You’re going to make mistakes no matter what aspect you’re referring to. The sooner you forgive yourself, the better. Drink water! Water has SO many benefits! Make it a goal to drink more water than you normally would! You’d be surprised at how often “hunger” is mistaken for dehydration! Love yourself. Once you realize your worth the time and effort it’ll take, your life will get dramatically better. Thanks for sharing! I loved reading this interview and I hope you will reach your goal soon. Congratulations I’m going to do my happy dance. Katie is VERY inspiring. She tells it like it is – sharing the good, not kicking herself for the bad. She’s sweet and just a bit crazy. Everyone should follow her. What is her page called? Good for you!!! You gave great advise!!! Congrats!! Thank you for being an inspiration! Hey Kate Cash, you got posted for the New Year. That should mean good things to come this year!!!! Happy New Year!! Katie is amazing! You’ll not meet a more open and honest person about her journey. Follow her. You won’t regret it! WAY TO GO! YOU ROCK!! Kate Cash is so awesome , real, and inspiring! She’s not been in a plateau, she’s regained 80 or so of those pounds. She hasn’t been stuck for a year, she’s gone backwards. Amazing story thank you for sharing. These are the same changes I’ve started making so I Know I will lose the weight by staying consistent. You look great! I’m 24 and was extremely depressed for years. I had an eating disorder back when i was 14 that lasted 2 concrete years then a couple relapse till i hit 21. I recently got out of the depression that kept me in bed for a good 4 years and started going to the gym and eating really clean with the exception of a fatty meal once in a blue moon. I started out at 155 pounds and now am almost at my first goal of 130 (134). This story touched me as soon as I read the title. Best of luck! Congratulations! You are such an example to other young people who have weight issues that you can lose weight … you just have to get up and move!! 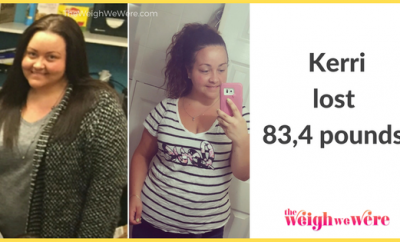 Your weight journey is a lifetime one and I wish nothing but the best for you! Congratulations!You are young and beautiful.Keep up for good health,happiness and long life.Blessings to you! Beautiful <3 Wonderful wonderful wonderful job!!! OMG motivated!! I wish that I could keep my motivation up like that!!!! Thank You for sharing your story with us. It was so inspirational. Did your body as you lost the weight (tighten up). If not How did you deal with the excess skin? This is what I an struggling with. Congrats to you!! You are beautiful. Awesome! But before I head over and like your page, I have to say that you must be from my neck of the woods because you said “pop”! 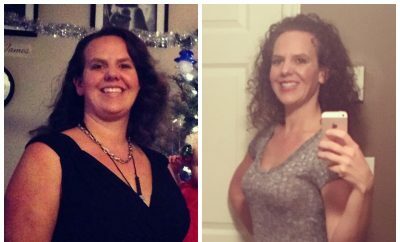 I have been reading success stories for a couple of months trying to find my “want to” to lose 100 pounds. However, the changes they have written about have all been so overwhelming, that I didn’t feel like it was something I could do. Thank you for emphasizing the “make smaller changes” concept!!! I am very proud of you, and thank you for the encouragement!!! So inspiring! Thank you for sharing your story! Katie, you are wonderful to take care of YOU! Hugs. Ahhhhhh I love this lady!!! She’s amazing!! 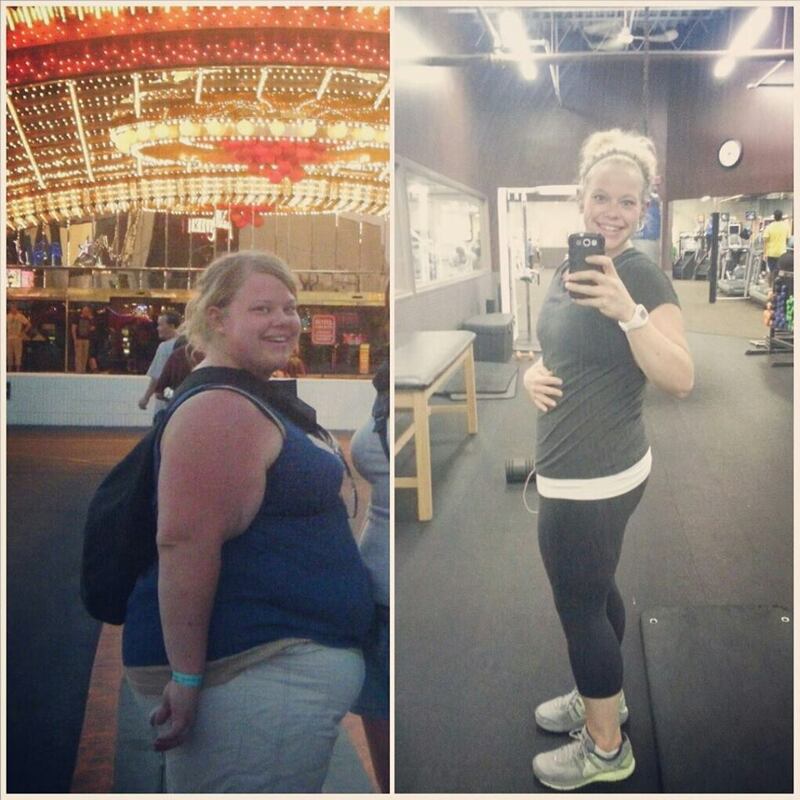 I love true stories like this it shows that weight lost is a lifestyle change. That living healthy is a choice and there’s no perfect program. Chose an exercise that you love and you will stick with it. A wonderful accomplishment! Keep us the good work! Love Katie! She’s been such an inspiration and she’s adorable. She’ll crack you up and motivate you every day! Gorgeous, I love that her smile never changed! Finally Alive After 25 is her page. She’s awesome!